Rihana is a well known painter and Zara has taken over her dad’s business. Both of them are successful and leading their lives in their own way. Rihana is always surrounded by men but Zara is on the shy line. They both are off for a vacation and that turns out to be a little alarming bell for both of them. What will happen when the dark secrets of Rihana and Zara will haunt them? Will they be able to cope up? Will they find solace in love? I really liked the title and the cover and that is the sole reason for picking up the book. They both were very creative and elaborative. The background, images, etc were all working in sync to make a nice appearance. The bright characters were the lifeline of the book. The author has been really precise in penning really strong people in her book. Let it be the maid of the house or the driver, the doctor or the dog, every character was nice, soothing and well crafted. Rihana and Zara were nice, very nice, really polished. I also liked the different males who were supporting the story in one way or the other like Harish, Zubair, Shaurya and Saif. And from all Tiger was my favourite. The narration was simple and clean. I didn’t find any flaws in that. The vocabulary was very easy and that made the book a quick read. 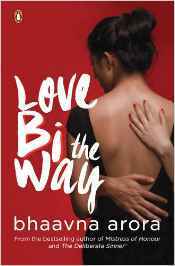 Love Bi the Way is quite an expressive novel. And that can be easily seen from the cover itself. The book is not about some people, the book is not about what one desires; the book is about what one discovers and feel. I liked the idea behind this book, exploring things to the fullest. Starting from the start, well both the ladies were radiant, dynamic and successful. What I liked about it was that there was no way the author tried to victimize the girls even though they both had very dark backgrounds. There strength was in there friendship and it was in full swing till the end. There inclinations were shown nicely, without any hesitations and that brought up the characters more nicely and in a refined manner. The starting of the book was perfect. The difference between the two leads, Rihana and Zara were shown fully, including their weak and strong points and how they have moved in this harsh world without support and sympathy. The book will fill you with admiration for these two young girls who haven’t compromised much to reach where they are and how they have fought with the inner demons and ruled the outer ones. I found the beginning of the book really interesting because I was getting to know more but then things were repeated, habits were shown more than what was really required, in short there was less of a story and more of incidents as we progress ahead. This was major drawback in the book. It made the book boring and not at all adventurous. The only time I felt that something will happen is when the two ladies are out on a vacation. I felt that it was shown in a more dramatic way then required. I didn’t find any place in the whole episode where I could wait and think for a minute because there was nothing to think at all. In the whole book the author has talked about the likes and dislikes of the two girls not to forget their dark pasts, not even at a single place the emotions ruled the characters. I felt that doing that all of a sudden at the end was not a good idea. There were a lot of places where things could have reached another point but author killed that hope by shrugging off that thought which she ignited in her characters. Coming at the dark pasts which the girls have been traumatized from, well that was not at all original for Rihana. I liked the revelation of Zara because that came in the former part of the novel where the story was much fresher then the latter section. I liked the part which the dogs played in their lives. Those incidents and the unbreakable bond were delightful. Summing up- The novel was a nice attempt in order to touch a different subject. But no doubts there were loopholes because many people have started commenting and writing on social issues so things have become really general. If and only if some different incidents could have been merged with the tale, things could have come up more refreshingly. Still a nice attempt. If you are looking for an easy read on LGBT issue then you can give the book a try. Bhaavna Arora is the bestselling author of The Deliberate Sinner and Mistress of Honour. Before her foray into writing, she was heading a business school as a director; she also trains students and professionals in leadership. She holds two management degrees and a PhD in leadership from Pittsford University.